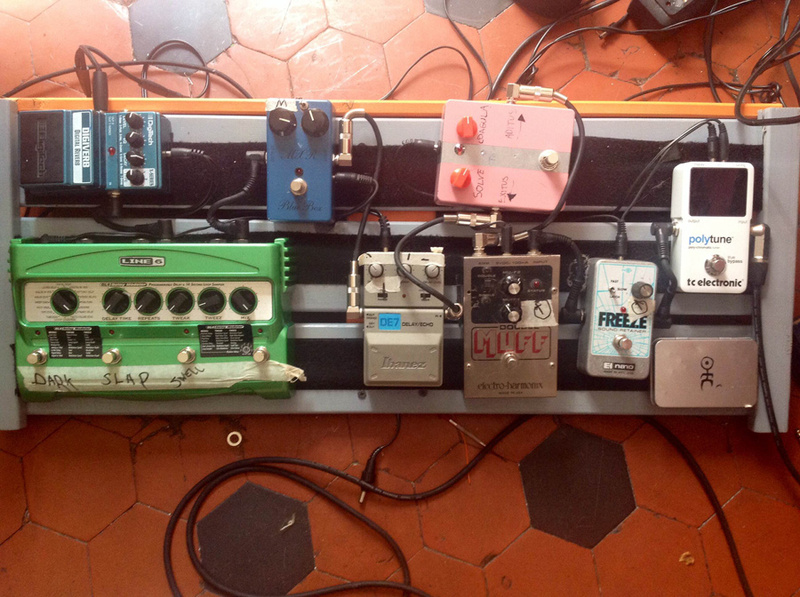 Today’s pedal line is from Riccardo Fassone. If you have a pedal line (doesn’t have to be in a board) for your rig, please email me a photo, bio, description of pedals and routing to pedalline@nulleffectsbay.com. Every Friday I’ll showcase a pedal line submission. Make sure you include any links to your band or music page. I play in a drone/noise/experimental band called Shabda (http://shabdahq.bandcamp.com/); we are based in northern Italy. We are a trio comprised of a laptop, a sitar and me playing guitar. Our style requires noisy, bass-heavy drones, so I built my rig accordingly. 1. Tc Electronic Polytune: it works and is visible. Really everything you need from a tuner. 2. EH Freeze: this is really the centerpiece of my style. I sample stuff and send it through the chain, then play with the knobs of the other pedals and make noise. 3. EH Double Muff: a really underrated pedal, more overdrive-y than a regular Big Muff. 5. Ibanez DE7: great delay pedal, it oscillates pretty easily when in “echo mode”. Very cheap as well. 6. MXR Blue Box: Modded Blue Box (more volume and mids). I use it for shits and giggles. 7: Line6 DL4: I use it mainly as a looper, for drones and textures. 8: Digitech Digiverb: cheap digital reverb, with a couple of cool features. I use it mostly in “church” or “reverse” mode. Guitar is usually a 1982 Ibanez AR50 or a 1999 Gibson LP Studio. In some songs I use a heavily modded Squier Tele. Everything goes in the front of a Peavey Classic 50 2×12 combo + (sometimes) an external 2×12 cab. In the amp’s loop I usually have a vintage rack-mounted ibanez HD1000, which I use as an harmonizer for adding a sub-octave. What is the EN logo box by the way?